Over 700 adults and children signed in for the Annual Kids Fishing Rodeo Day, sponsored by Pickens County Sportsman's Club and Georgia Department of Natural Resources - Georgia DNR, on Saturday, May 12th from 9 am to 2 pm. 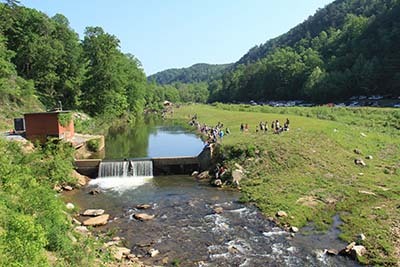 The FREE event teaches children ages 15 & under the sport of trout fishing by letting them, not their parents or another adult, fish and enjoy themselves. Each angler is limited to 8 trout per fisherman with a fishing license NOT required during the event. On Thursday and Friday, those with disabilities and assisted living homes are given the opportunity to fish. Fourteen Pickens County School bus drivers volunteered their time to transport the assisted living facilities on Friday.